March Series 10 Pumps most commonly used in industrial, OEM, chemical, hydronic and solar applications for handling highly corrosive or mild chemicals, acids or solvents, condensate pumps, and metering pumps. March Pump Series 10 are centrifugal magnetic drive pumps which have a maximum flow of 200GPM and a maximum head of 160 feet. They are available in Kynar. The inlet is 3 inch and the outlet is 2 inch. They use a 10 horsepower three phase motor. 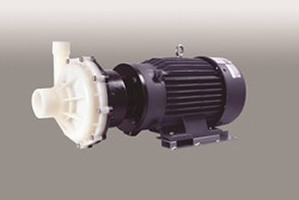 FACT: March Series 10 Pumps have explosion proof motors for hazardous locations and 575V motors for additional options.